To get to the dam, turn off into either Williams Road or Kyola Road from George Downes Drive near Kulnura. There is a navigable map here. 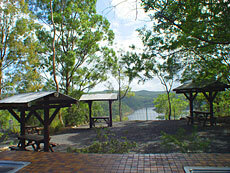 This will take you to the picnic area with its view of the Dam and the surrounding area. 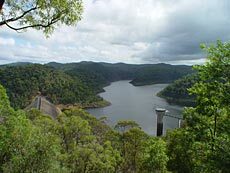 The dam is 80m (260') high with a crest lenth of 380m (1,200') and a storage capacity of 190,000ML (about 30% of the capacity of Sydney Harbour). It is composed of about 1.2M cubic metres of rolled, soft sandstone from the Narabeen Group of sandstones and siltstones. 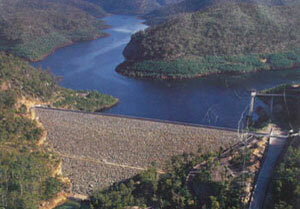 The embankment also contains about 100,000 cubic metres of processed basalt from quarries at Kulnura and Peats Ridge. The face contains about 13.500 cubic metres of concrete and covers an area of about 30,000 square metres. Below on the left is a rare photograph of the dam taken during construction in 1981: the area to the right is all under water now. 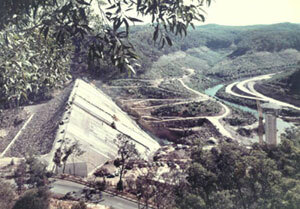 On the right is a photograph of the completed dam taken in May 1986. More rare photographs taken during construction are here. There were a number of families living in Dubbo Gully downstream from the weir. Offers to resume this land for safety reasons were taken up by all those living there, with the exception of one family. They have access via a locked gate at the end of Waratah Road. The area is now a National Park (part of Mcpherson State Forest) and the same access enables organised visits to the area to be conducted, including walks, 4-WD and cycling/mountain biking. The Hinterland History Ride (PDF) here provides more information on a mountain bike ride, with a map and detailed directions. In the early years the weather pattern was more favourable for rain in the catchment area. When the dam was 74% full, an 11Km tunnel was in the process of being drilled to link the dam with Boomerang Creek for water transfer. Heavy rains fell and valves had to be opened to release water down the slipway, which flooded a remaining property. In spite of this the water level got to within 600mm of the tunnel entrance before the rains stopped. The tunnel has never been used because the rest of the project was not completed. Over the years since then, the dam has fluctuated between just over 20% capacity to just under 70%. The Lower Wyong to Mangrove Creek Dam Transfer Project currenly under way involves the construction of two new pump stations and pipeline between Wyong River, Mardi Dam and Mangrove Creek Dam. This will transfer water from Mardi Dam into Mangrove Creek Dam to enable more water to be harvested from Wyong River and Ourimbah Creek. Mardi Dam will operate as a balancing storage with spare capacity ready to store water harvested during high river flows in Wyong river and Ourimbah Creek. The Mardi Dam to Mangrove Creek transfer system will also transfer water back from Mangrove Dam when required to augment supply. The project is being funded by the Australian Government Water Fund at a cost of close to $90M.